We’re used to seeing cars listed on eBay. It’s a pretty normal thing. 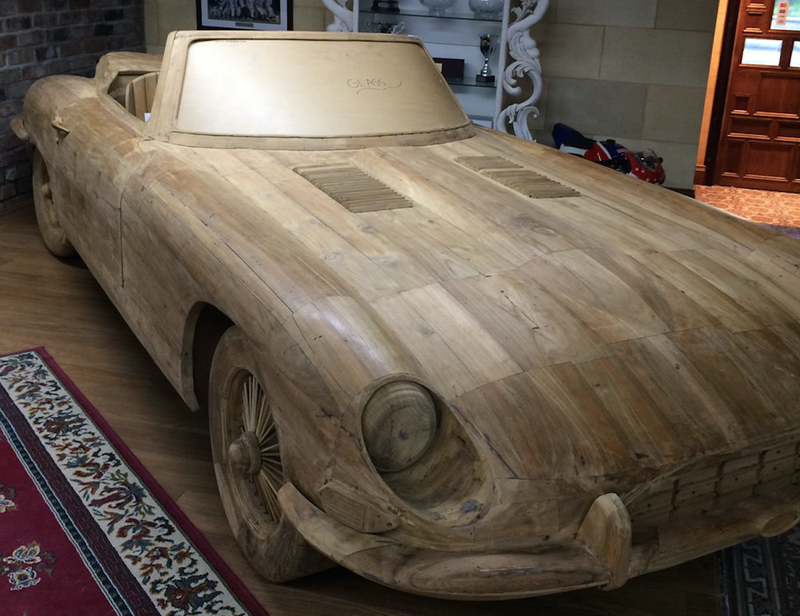 But an all-wood, hand-carved model of a Jaguar E-Type to scale? That’s a new one. The listing claims that a group of woodcarvers completed the piece—which does not have an engine, unlike the new wooden supercar that took five years to build—and months of work went into it. The wood used is teak, and despite having no engine, the seller claims that the steering works on a rolling chassis. This car is essentially an adult-sized childhood dream, but it comes with a not-so-childish listing of about $19,771. But there’s a catch—the seller is only shipping to the United Kingdom, where the item currently sits. That’s a downer. The Jaguar woodmobile isn’t so much a car as it is an art piece, but it’s an impressive one nonetheless. While Michelangelo and Bernini spent their time admiring man in sculpture, these modern folks are busy recreating machine. If you do live in the area that the car ships to, this is your chance to purchase some new home decor. If you don’t, well—it’s nice to admire the handiwork on such a large scale. And if you by the car and decide that you don’t have room in the garage (or your personal car museum, whatever) for it, the seller has a note on the listing that he or she will take returns for up to 14 days and pay the return shipping. The seller must be pretty confident that a buyer will keep the purchase—unless an engine gets plopped into that car and it magically starts running, the shipping costs must be astronomical.